The only constant in the hot tablet and smartphone market remains change with an endless array of smartphone apps battling it out for people’s attention. The top 50 Android apps take up 60 to 65 percent of smartphone users’ time, but those top apps are in near constant flux. 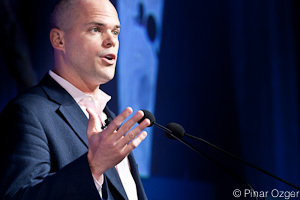 Eleven of the top 50 apps swapped out in the past three months, Jonathan Carson, GM of digital for Neilsen told attendees at the GigaOm Mobilize 2011 conference on Monday. The growth in Android-powered devices continues apace but comes at the expense of RIM’s (s RIMM) BlackBerry and other non-Apple (s AAPL) devices, not the iconic iOS-powered iPhone, said Carson. “Folks say that Apple fans are holding off for iPhone 5 but we still see iOS doing very well,” Carson said. And people are buying smartphones at a blistering pace, but they’re not using them a hell of a lot for phone calls, he added. Carson showed a typical (random) user’s smartphone usage with huge usage spikes for such favorite apps as Angry Birds, FaceBook and Twitter. There was very little actual phone use. Nielsen, the big ratings and research company, is trying to help advertisers monetize smartphone and tablet usage, and pays a lot of attention to how usage of the two device types differs. The company’s research shows a typical smartphone user very active during the day but starting to transition off his or her iPhone to the iPad after in the evening. Nielsen sees iPads as more popular for users wanting to consume long-form content–books, TV shows etc. but also sees them dividing their attention with other things. A big portion of iPad users, for example, use their devices while watching TV, in meetings and in the bathroom, for example. This “simultaneous use is very important–people are dividing their attention,” he said. “This is a huge challenge for the TV companies,” he noted. Agree completely that it’s about the apps. But this also includes web-based apps; it’s not just about the native apps one can acquire through the iTunes App Store or Android Market. Especially for business apps….